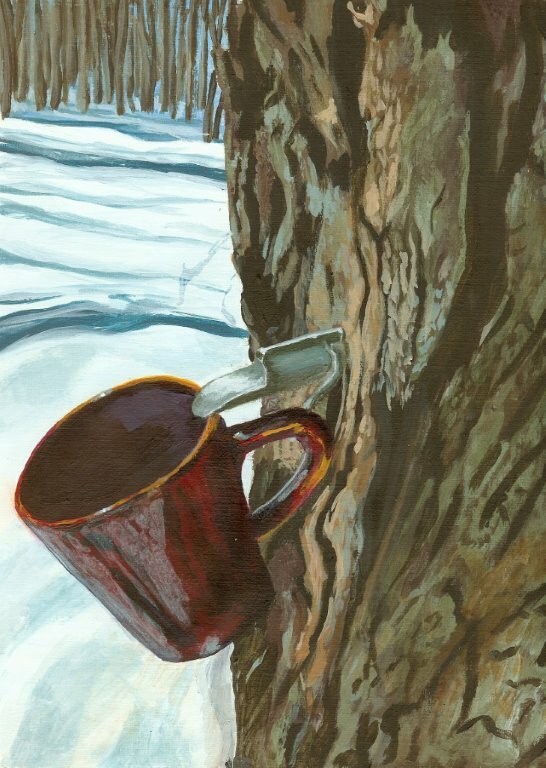 If you missed last weekend, you can make the drive this weekend to the Annual Maple Syrup Festival here on St. Joseph Island. Always the first two full weekends of April (this year that’s April 6, 7 & 13, 14) the St. Joseph Island Maple Syrup Festival is held at the Royal Canadian Legion from 8:00 am – 6:00 pm. It`s all-you-can-eat pancakes, sausage, pure St. Joseph Island maple syrup, and, of course, fairtrade coffee. This is the third year in a row we have donated over 16 kg of fairtrade coffee to the Legion for this event. After you eat, stay a while to check out the maple syrup, maple products, and various arts and crafts for sale. Stop by to chat with Shane, too. He`ll be there this weekend selling packaged coffee and tea. Thanks to Sally Kennedy from Stourie Brae (Windy Hill) Alpacas in Laird Township, for looking after our table last weekend while we were away in Southern Ontario. My sister brought me down a bag to try as she knows I love GOOD coffee. I love it! (maple syrup blend). Do you make up sample boxes so a person like myself could try an assortment before purchasing a larger package? I’m thinking maybe like you wedding favour size with customer choice of 6 or 8 flavours …just a thought.